Meet The Press (MTP) is increasingly getting attention for sinking ratings. 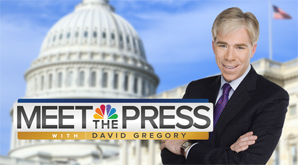 The ‘moderator of Meet The Press’, David Gregory, is coming under fire as the reason viewers are turning elsewhere. Other causes include the cable news proliferation diluting the importance of Sunday morning news-talk shows. The cause may be more fundamental. MTP is highly produced and gives us images of the week and the CNBC Executive Summary, or is it look ahead? Basically these are things I don’t care about and certainly not my reason for watching. The show bounces from segment to segment giving us the 50,000 foot view of issues we can get anywhere. Even the round table of talking heads, which I really used to enjoy, seems to be a drag. It often seems the set has become the star of the program. What is missing are in-depth interviews with newsmakers. Isn’t this how MTP made its bones? It gave us what we couldn’t get anywhere else. Today we are treated to assembly line interviews that rush from one to the next. How many times do we hear Gregory say to a guest, ‘quickly’ and/or ‘in the minute we have left’. The show has become the cable news model. Give me 30 hard hitting minutes of interview time with a featured guest, 10 minutes of opposing views and 20 roundtable discussion. Bang, you have a show. If you really want to get crazy you could even have members of the press ask the newsmaker questions. As it stands now, David Gregory is the lone questioner that comprises ‘the press’. Maybe the show should be titled, ‘Meet David Gregory’? To be relevant Meet The Press, as well as all Sunday news-talk shows, must give us more than what we get in our cable news and internet saturated world. Lastly, some critics have made unflattering comparisons between Gregory and his predecessor. Blaming David Gregory for not being Tim Russert is not only unfair, it assumes the world has not changed in the five years since Russert’s death. The rate of change has accelerated and Meet The Press has got to the hit the gas. Strangely, a slower time in the show’s history may provide the answer.